Built in the early 1900s, our 80-acre, certified green resort is flawlessly set at the base of the striking Santa Catalina Mountains. 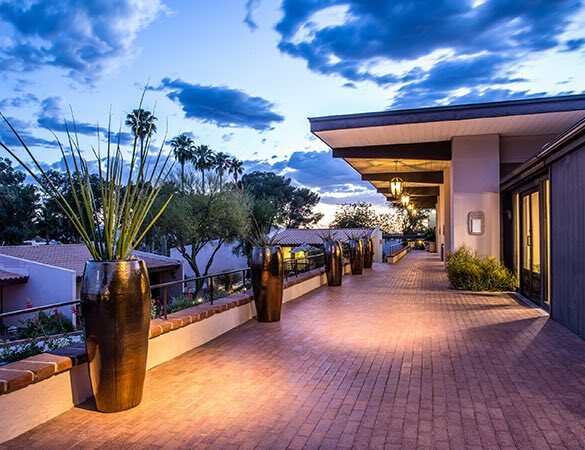 A favorite Tucson resort-hotel and vacation destination, Westward Look Wyndham Grand Resort & Spa offers visitors of all ages the joy of getting close to nature with on-site hiking, biking and horseback riding trails. Views of the mountains and city below are abound, creating a true sense of serenity for Tucson vacations. Westward Look Wyndham Grand Resort & Spa, a historic hotel in Tucson, grew from an elegant hacienda-style family home built less than six months after Arizona became a state in 1912. Tucson’s population was a mere 13,000 residents when William Watson and his wife, Maria, bought 172 acres of homestead land that was considered desolate, isolated and a long ride on a bumpy dirt road, far from the emerging city in the valley below. Yet, the Watsons set about building their dream home. They sought the services of well-known Tucson architect Merritt Starkweather. The Watsons envisioned a traditional adobe home, popular in the American Southwest in the early 1900s. Under Starkweather’s guidance, their romantic dream was realized. An elegant adobe-style home was built, complete with an artist’s loft, spacious living quarters, Spanish-style courtyard and glorious views of the lush Sonoran Desert and the Santa Catalina Mountains. So convincing was Starkweather in his design and construction of this authentic “adobe” home that it was decades before anyone realized that the walls are not really adobe, but cleverly disguised concrete and steel, finished with adobe. From this christening, the legend of Westward Look Wyndham Grand Resort & Spa took root. Many guests returned year after year, some staying for a few weeks and others for months at a time at our hotel near the Catalina Foothills in Tucson, AZ. The Nasons partnered with American Airlines, inviting the pilots and stewardesses to stay at the ranch and renting rooms to the families of pilots who came to Tucson for flight training. In the 1950s. Walt Disney filmed his award-winning documentary, “The Living Desert,” in this area and housed some desert animals in the stables. Once the filming was over, Mrs. Nason contacted the fledgling Arizona-Sonora Desert Museum and offered to donate the prairie dogs and coatimundi that were left behind. That was the start of the museum’s small mammal collection. A regular winter visitor to Westward Look was Chicago artist Haddon Sundblom, who created icons of advertising, including the Gerber baby, Aunt Jemima, and the Coca-Cola Santa. In 1953, he painted two of the Nason daughters serving Santa a Coke. That endearing image endures today on highly collectible greeting cards, serving trays and other memorabilia. Rooms are adorned with lavish features such as Sealy Posturepedic pillow-top mattresses on girls and the artist who painted these enduring holiday images. Kids stay free: Children 17 and under stay free when occupying same room as paying adult and using existing bedding in the room. Pets or animals allowed: We love pets at the resort! This 80-acre desert oasis is at the base of the Santa Catalina Mountains and is very pet friendly. There is a $75 non-refundable pet deposit per stay. Photo ID: Required at check-in.